Lower Dolpo Trek furnishes you with the colorful hidden treasure of the isolated Dolpo Region in western Nepal. Lower Dolpo trekking trail is also a less crowded hiking route with few high passes and cheaper in comparison to the Upper Dolpo Trek. Trekking to the lower Dolpo region take you through scenic Phoksundo Lake, two high passes - "Numa La Pass" and "Baga La Pass", spectacular desert landscape, and Dho Valley. Your journey to the Lower Dolpo begins with a 45 minutes flight from Kathmandu to Nepalgunj then, half hour to the Juphal Airport. Set on foot from this point for the next 12 days to observe the breathtaking scene, deep gorges, spiritual monasteries, and an ancient Tibetan culture of the Dolpo area. The trail follows the traditional salt trading route with the Tibet where Yak caravans can be seen live with tinkling bells transporting salt, cotton, barley, and rice to the Tibet. Max. Altitude: 150 m (Nepalgunj). Day 02: Fly to Juphal and trek to Dunai. Max. Altitude: 2,850 m (Dunai). Day 03 Trek to Tarakot. Trail Attractions: Terraced fields, Chortens, and Gompas. Max. Altitude: 2,280 m (Tarakot). Day 04: Trek to Laini. Trail Attractions: Tarap Chu River, Suspension Bridges, Sandul Gompa, and farm terraces. Max. Altitude: 3,160 m (Laini). Day 05: Trek to Nawarpani. Trail Attractions: Steep Trail, Chyugur Khola, narrow gorge, and adventurous jumping walk. Day 06: Trek to Dho Tarap. Trail Attractions: Juniper bush, Wild rose, place of Bon Po and Chaiba religion, Tibetan and Magar's inhabitants. Max. Altitude: 4,200 m (Dho Tarap). Day 08: Trek to Numa La Base Camp. Trail Attractions: plain valley, river covered with green grasses, Tokyu Village, Monastery. Max. Altitude: 4,440 m (Base Camp). Day 09: Cross Numa La Pass and stay at Pelung Tang. Trail Attractions: steep walk, north face of Dhaulagiri Massif, and cross Num La Pass. Max. Altitude: 5,190 m (Numa La). Day 10: Cross Baga La Pass and stay at Dajok Tang. Trail Attractions: view of the wonderful landscape, Kanjirowa Himalayan Range, and cross Baga La. Max. Altitude: 5,070 m (Baga La). Day 11: Trek to Ringmo. Trail Attractions: Pine forest, pasture fields, and traditional Tibetan Village Ringmo. Max. Altitude: 3,600 m (Ringmo). 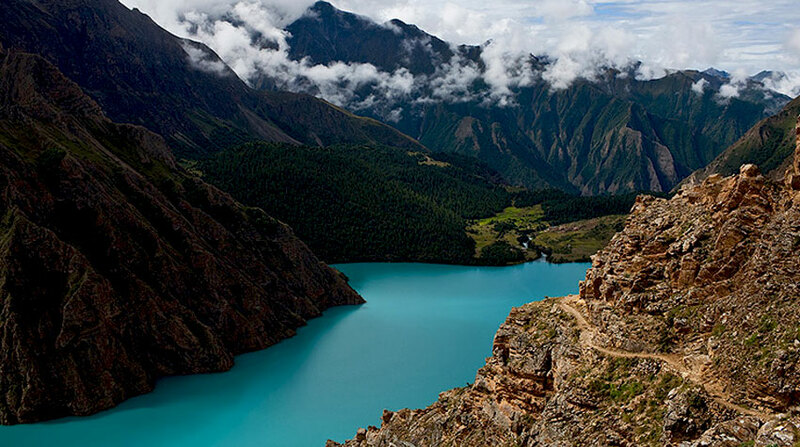 Trail Attractions: Tibetan Buddhist Monastery, and hike to Phoksundo Lake. Day 13: Trek to Shyanta. Trail Attractions: Medicinal minerals that heal anything in this area, and small villages. Max. Altitude: 2,520 m (Shyanta). Day 14: Trek to Juphal. Trail Attractions: meadows, birch trees, and end of walking. Day 15: Fly to Nepalgunj then to Kathmandu. Flying: 45 mins to Juphal, 1hr to Kathmandu. Drop to your hotel. Lower Dolpo Trek finished here! Nepalgunj to Juphal and back flight tickets. Guide, Porter, Helper, and Cook. All required gears, equipment, and tents. Government Taxes, Park Permits, and Special Permits. Extra night accommodation charges at Nepalgunj in case of flight cancellation. Wants some modification on Lower Dolpo Trekking itinerary? contact us to customize it.